It has long been known that Kamomioya-jinja was located in a spot of the great historical siginificance: remains of the Jomon Period (ca.10,000B.C.-ca.300B.C.) 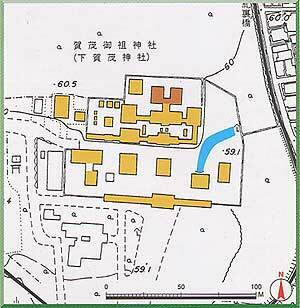 were excavated at the original site of the shrine complex. As a guardian shrine during the establishment of the Heian-kyo, Kamomioya-jinja counted numerous worshippers among the artistocracy. It existed in its present from by the begining of the 11th century, and was ritually rebuilt at regular intervals thereafter. Most of the shrine buildings burned down during the Onin War (1467-77), together with the surrounding forest, Tadasu-no-Mori. 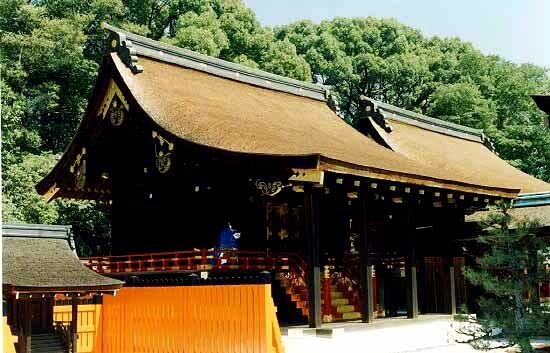 In the reconstruction that took place in 1581, the entire shrine was restored to its Heian-Period condition. The Honden (main shrine building) has been rebuilt eight times since the begining of the Edo Period, and the present East Honden and West Honden dated from the last reconstruction in 1863. The Honden is built in the nagare (folwing) style, and retains the ancient from very clearly. Other extant shrine buildings, including the Noritoya (ritural prayer hall), rebuilt in 1629, reminds us of the Shinto shrines of that era. Kamomioya-jinja hands down the traditions of various anicient arts, rites and festivals including the Aoi Matsuri. As for the shrine's grove, several novels including The Tale of Genji refer Tadasu-no-Mori as a place of natural beauty which have various aspects of seasons. It remains as an open space for local residents.